Hearts say they have now settled their entire wage bill for August. Manager John McGlynn, a member of the Tynecastle coaching staff and six players did not receive salaries that were due on Monday. The Edinburgh club were repeatedly late in paying players last season, with three consecutive delays. 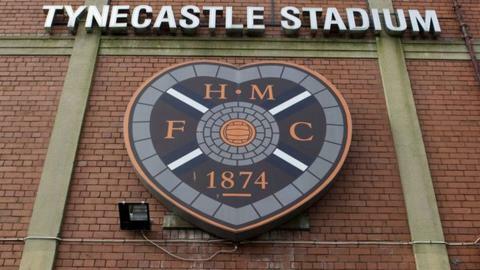 Hearts were charged "with failing to behave with the utmost good faith to the Scottish Premier League", although no penalty was imposed. All 12 top-flight clubs have still to receive about £300,000 each from the the SPL, who were due to discuss the latest wage delay at a board meeting on Friday. Hearts were also waiting for television revenue from their recent Europa League meeting with Liverpool. Prior to the late payment, McGlynn admitted it "might not be the last time" he would have to address the issue. But he was sanguine about the setback, saying: "It doesn't concern me, really. "The money's coming in from a very credible source; it's not like we don't think the money's not going to come in. "It's not like the last time when we were waiting on the money to come from Lithuania [where majority shareholder Vladimir Romanov is based]. "I'm not that worried. My wife works, so I'm all right." Earlier this week, Hearts said in a website statement that a "vast majority of its 45-man squad" had been paid their salaries in full and that those who had not "will be paid shortly". McGlynn moved to Tynecastle from Raith Rovers, where he worked under tight financial constraints. And Hearts have pruned their squad size significantly in the last year. "No-one said there's going to be ongoing issues with the wages, but you cannot be daft and think these things are not going to come up," added McGlynn. "You hope they're not going to come up, obviously, because it is a distraction that you could do without. "It has risen up and you have to deal with it, play the cards that you're dealt. "The players have been here before, done it before and they've always been paid. It's maybe not been on time, but they've always been paid. "They're more comfortable with the situation right now. Like anyone they'd have preferred to have been paid on time and not had this issue, but they've dealt with it very, very well so far."